Modification of the material might solve this issue. "However, modifying the molecules by attaching side chains affects their ferroelectric properties," explains Ivan Terzic, a Ph.D. student at the University of Groningen's Department of Polymer Science and co-first author of the Nature Communications paper. Terzic says, "Others have tried to prepare PVDF block copolymers, but they could only produce blocks with short polymer chains. In that case, the blocks mix and show no phase separation." Terzic used block copolymers to improve the interactions between PVDF and inorganic nano-objects and to improve their dispersion of inside the polymer. For example, magnetic nanoparticles can be added to the PVDF to produce a multiferroic material that has both ferroelectric and ferromagnetic properties, which means it can be coupled. Furthermore, changing the behavior of PVDF could make energy retrieval more efficient. "That would allow us to make a highly efficient capacitator that could be used wherever stored energy needs to be released fast, like in defibrillators or to convert direct current from solar panels to alternating current." 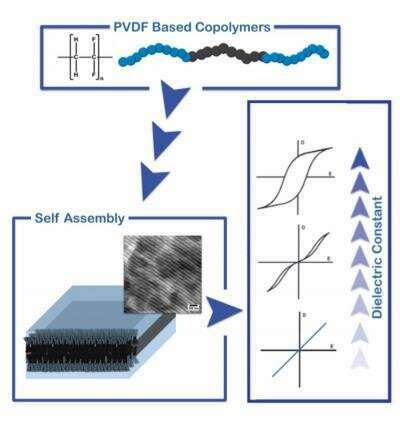 The authors have created a toolbox for the production of PVDF-based block copolymers with tunable properties. "We can use this to increase our understanding of the ferroelectric and other properties of PVDF, but also for new applications," says Terzic. "The organic PVDF is flexible, lightweight and non-toxic, in contrast to some inorganic ferroelectrics that often contain lead. And it is bio-compatible, so medical applications are another interesting possibility."